The Pioneer Venus Multiprobe (PVM, Pioneer 13) consisted of a bus which carried one large and three small atmospheric probes. The large probe was released on 16 November 1978 and the three small probes on November 20. All four probes entered the Venus atmosphere on December 9, followed by the bus. net flux radiometer experiment to map the distribution of sources and sinks of radiative energy in the atmosphere. The radio signals from all four probes were also used to characterize the winds, turbulence, and propogation in the atmosphere. 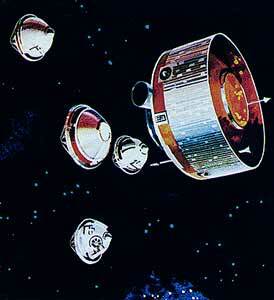 The small probes were each targeted at different parts of the planet and were named accordingly. The North probe entered the atmosphere at about 60 degrees north latitude on the day side. The night probe entered on the night side. The day probe entered well into the day side, and was the only one of the four probes which continued to send radio signals back after impact, for over an hour. an ion mass spectrometer to study the composition of the atmosphere. With no heat shield or parachute, the bus survived and made measurements only to about 110 km altitude before burning up. The bus was a 2.5 m diameter cylinder weighing 290 kg, and afforded us our only direct view of the upper Venus atmosphere, as the probes did not begin making direct measurements until they had decelerated lower in the atmosphere.